Some of Kristine Donnelly's art. This week Highlands High School art teacher Kristine Donnelly adds Northern Kentucky University’s Main Gallery to a list of solo exhibits that includes the Taft Museum of Art, 21c Museum Hotel, and University of Cincinnati galleries. Supplying the Void, Works on paper by Kristine Donnelly opens Thursday and continues through March 4. “Works on paper” understates Donnelly’s art -- inspired by historical ornament and pattern, Donnelly creates large-scale cut paper sculptures and installations suggesting wallpaper and lace. Her work is painstaking and labor intensive. Donnelly walked RCN through the creation of Cover up, pictured above. 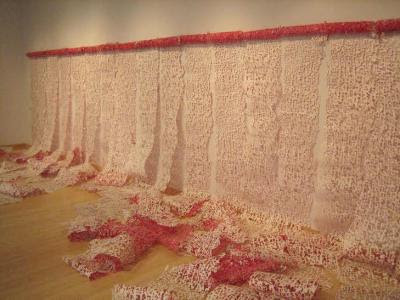 It’s made of 18 rolls of cream drawing paper, ranging in length from 8 to 30 ft. with an abstract red pattern screen printed on one side. “When I was making Cover up I was thinking a lot about the function and psychology behind interior direction, especially wallpaper,” Donnelly explains. “How when wallpaper was invented it could quickly and economically assign a mood to a space." Talking about her exhibit’s title Supplying the Void, Donnelly echoes Knight’s observations. “Positive and negative space are both important in my work. The process is reductive; I take large rolls of paper and cut them into intricate designs. In doing so, the negative space, “voids", are so important. They reveal layers, light, and shadow. Donnelly became interested in working with paper as a grad student at University of Cincinnati’s DAAP (College of Design, Architecture, Art, and Planning). “I was working on a series of paintings of figures with patterned backgrounds behind them. At Highland High School, Donnelly teaches – and learns from her students. “I want my students to have a solid understanding of technique and design. I want them to combine this with their own creative problem-solving to make work that is original, inventive and personal. In teaching them about historical, contemporary and local artists I want them to understand that art is everywhere and it is powerful. They teach me the importance of making work that is relevant and personal. If a personal connection can be made, the work will always be stronger. Also on view at NKU: Librartis, Artists Books You Can Touch is curated by Fabio Mazzieri of Sienna, Italy and includes work by more than 100 international artists and invites viewers to turn the pages. Supplying the Void, Works on paper by Kristine Donnelly/Librartis, through March 4. NKU Galleries, Fine Arts Center, Northern Kentucky University, Highland Heights. Artist reception: 5-7 p.m. Feb. 18 (snow date Feb. 25). Artist talk: 3:30 p.m. Feb. 25. Gallery hours 9 a.m.-9 p.m. weekdays. Free.